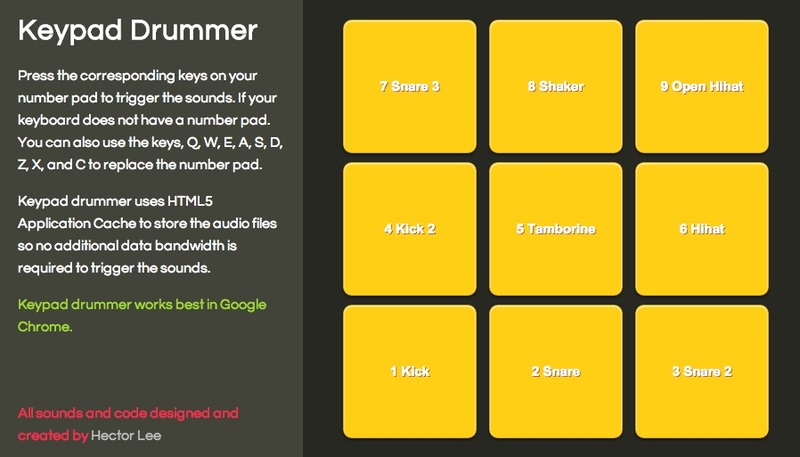 Keypad drummer is a web-based drum machine which allows you to play beats and grooves right in your web browser. Keypad drummer uses HTML5 caching to improve performance. Keypad Drummer was created with the idea that it shouldn’t take installing and laughing a whole bunch of software before you can start playing a beat. With Keypad Drummer all you need is a compatible web browser which you should already have and you are set. the first time Keypad Drummer is used, there may be some latency at the beginning as it is download the audio files. This should clear up in a minute once the audio samples have been downloaded.